Diarrhoea and pneumonia are the two main causes of death for children under five, the report said. Humanitarian needs had been exacerbated by "recurrent natural hazards", such as frequent floods and drought. "Amidst political tensions, an estimated 18 million people across DPRK [North Korea] continue to suffer from food insecurity and undernutrition, as well as a lack of access to basic services," the UN report said. "Furthermore, 10.5 million people, or 41% of the total population, are undernourished." 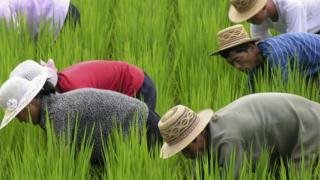 Isolated North Korea, which has a population of about 25 million, has faced significant food shortages for years. Hundreds of thousands are believed to have died during a widespread famine in the 1990s. The UN report said the situation had improved since then, "in part as a result of humanitarian assistance". However, two-thirds of North Koreans still depend on food being distributed by the state. The UN report said rations of items such as cereals and potatoes had been reduced from 380g per person per day to just 300g for several months last year. "Fluctuations over the year are normal," it said, but added that state "rations are consistently lower than the government target of an average of 573g per person per day". North Korea is heavily sanctioned under UN resolutions for its nuclear and missile tests. The report said international sanctions had affected humanitarian efforts, making it more difficult for agencies to transfer funds and equipment. It also noted a "radical decline in donor funding since 2012". "As a result agencies have been forced to significantly reduce the assistance they provide. Consequently, critical needs of some of the most vulnerable have not been met. "More predictable funding is urgently required to ensure the immediate needs of the most vulnerable are addressed."